Check one of our members’s contribution with this article which tells you how to work around LV systems as an electrical engineer. Enjoy and if you want to, you can leave more remarks. Every single day, engineers and technicians work on low voltage systems supplying resident and commercial buildings. In most of the cases, the job successfully goes without hitches. Occasionally though, something goes wrong, either through an overlooked hazard, or a plain accident that results to electrocution and injury. The article highlights how to identify low voltage conductors, why they are dangerous, and how to de-energize the systems for a safe working environment. In most regions, the utility poles carry LV conductors, communication lines, as well as HV conductors. 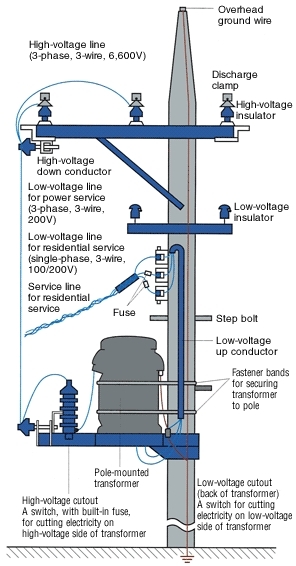 In most cases, the LV conductors are installed as single lines on the lower section, with HV lines near the top of the pole. In situations where there is a transformer installed, the high voltage from the main input into the transformer, with the low voltage as the main output to residential areas. The engineer in a particular area is charged with determining the power requirements for each area, thus determine the output voltage. Most people associate low voltage conductors with lower risks compared to high voltage. Mush of this, I presume is directly associated with the ‘low ‘term itself. With such in mind, inexperienced engineers then presume a simple tripping of the circuit breaker and a simple flash. However, due to proximity and the above presumptions, more injuries and potentially fatal incidents occur from contact with LV conductor. Do note that a low current can lead to irregular heartbeat, muscle contractions and serious burns. Two major factors may increase susceptibility to injuries and burns due to LV and MV voltage. The first is small work clearances. This leaves a very small room for error. Considering that tool usage and maneuvering is inevitable, engineers often find themselves on the wrong side of the current, literally. The second factor is the prevalence of equipment that utilizes low and medium voltage. Supply of the voltage into any equipment with a fault, more so, in the aforementioned constricted spaces, can result to arc flashes, and fire. The resulting heat can vaporize liquids, destroy equipment and cause serious harm to workers on site. When working around energized low voltage equipment, the first task is to de-energize the equipment. De-energizing eliminates any risk of injury due to electrocution and shocks. Secondly, lock out the equipment before commencing any maintenance work. Locking primarily eliminates any chances of someone inadvertently turning on the equipment in the course of maintenance. The complete procedure takes the following form. Shut off and lock the machine in a safe manner to reduce chances of hurting other workers, and yourself of course. Throughout the procedure, it is tantamount that engineers and technicians use protective clothing and equipment. It is the duty of the senior engineer to ensure that all safety measures are adhered to. Do note that electrical incidents, even from low voltage systems, are usually fatal; therefore there is no room for compromise. Thanks for reading, do you have something to add? Let’s share our tips! or copy this trackback: http://engineering.electrical-equipment.org/electrical-distribution/working-around-low-voltage-systems.html/trackback from your own site. 14 But it sells for $20 more.